Phil Roscoe is the head of education and welfare at Liverpool Football Club. This job sees him oversee the welfare, educational and holistic progression of the players from the Elite Development Squad, U18s and U9-U16 schoolboy programme. 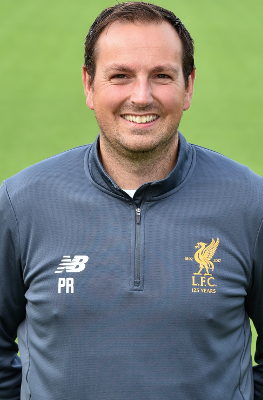 Phil also manages the full-time education programme based at Rainhill high school where players ranging from 11 – 16 years of age attend. Prior to assuming his role in Kirkby, Phil spent six years as a lecturer in sport development and fitness at a further education college in Merseyside. Phil has over 15 years’ experience working in Academy football as a coach and in the job role that he has now. "Within the Academy we provide a very structured and focused programme which not only gives players the best chance possible to progress within the football industry but also educationally as individuals," said Phil. "This is achieved on a post-16 level by providing the players with an opportunity to develop academically and vocationally by undertaking educational programmes such as A-level, BTEC, NVQ and key skills. "The players will also take part in external qualifications which will provide a mechanism for the players to improve their individual skills such as communication, organisation and leadership." "Within the U9-U16 age group programme I monitor the welfare and educational progression of each boy through regular correspondence with their schools, parents and age-group coaches. "This excellent and continually developing relationship allows each registered player at our academy the best chance to progress as a player and improve within their schooling. "This also allows the players from a very early age to identify the expected educational and behavioural traits needed to develop as a Liverpool player and achieve their maximum potential within their school environment." Click here to read our Behind the Badge feature with Roscoe.